ECobalt auch mit einem Aufschlag von ~12% .. Li und Cobalt haben vielleicht Ihren Boden gefunden? Lithium America etc auch die letzten Tage mit ordentlicher Performance ..
ZUG, Switzerland, Nov. 6, 2018 /CNW/ - Katanga Mining Limited (TSX: KAT) ("Katanga" or the "Company") today announced that its 75%-owned operating subsidiary, Kamoto Copper Company SA ("KCC"), will temporarily suspend the export and sale of cobalt at its Kamoto Project in the Democratic Republic of the Congo until further notice. The presence of uranium was recently detected in the cobalt hydroxide produced at the Kamoto Project in levels that exceed the acceptable limit allowed for export of the product through main African ports to customers. To date, the total cobalt production impacted by the sale suspension amounts to 1472 tons of finished cobalt. The low levels of radioactivity detected in the uranium to date do not present a health and safety risk. Production of cobalt at the Kamoto Project is expected to continue without reduction in the quantity produced. The Company is currently conducting additional surveys to identify the source of the uranium and exploring various options to mitigate the impact of the sales suspension. KCC intends to construct an Ion Exchange system to remove uranium from cobalt produced at the project. The Ion Exchange system is expected to be commissioned by the end of the second quarter 2019 subject to obtaining the necessary approvals. The finished cobalt production will be stored on site and processed in the Ion Exchange system once construction is completed. Once the Ion Exchange system is commissioned, the processing and sale of the cobalt stored on site is expected to be completed before the end of the fourth quarter of 2019. The construction of the Ion Exchange system is expected to cost approximately US$25 million. The temporary suspension of cobalt sales during the construction of the Ion Exchange system is expected to negatively impact revenue of Katanga during the fourth quarter of 2018 and the first and second quarters of 2019. The revenue that would otherwise be recognized on cobalt sales during the fourth quarter of 2018 and the first and second quarters of 2019 is expected to be realized in the third and fourth quarters of 2019. Currently the Company has not received any claims on the sales which commenced in the second quarter 2018. Blackbird Energy Inc. and Pipestone Oil Corp. have entered into an agreement dated Oct. 29, 2018, that provides for the combination of Blackbird and Pipestone Oil. Concurrent with the transaction, Blackbird and Pipestone Oil have entered into agreements with certain of their existing shareholders who have committed to common equity financings totalling $111.0-million, and Pipestone Oil has arranged $198.5-million of debt financing. The transaction and financings will result in the strategic combination of two adjacent and contiguous Pipestone Montney land bases under a single well-capitalized, high-growth company that will operate under the name Pipestone Energy Corp.
GGD aufgrund schlechter Q-Zahlen wurde charttechnisch die 0,30 CAN$ nach unten durchbrochen und 0,20 CAN$ wurde erreicht. 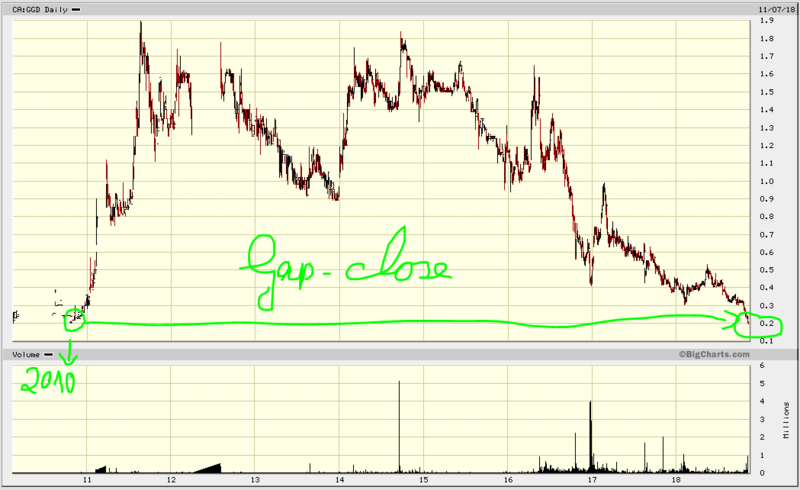 ==> Gap-Close 0,20 CAN$ !!! Erreicht wurde das Gap-Close mit erhöhtem Volumen, ob das schon die Ausverkaufsstimmung war, weiss ich nicht und ob noch einige Aktien wegen tax-selling season auf dem Markt geschmissen werden, weiss ich auch nicht. Ich weiss nur, das GGD aktuell mit dem cash-Bestand an der Börse bewertet wird. Daher aktuell bei mir weiter strong watchlist. Aktuell bei mir noch kein auf, da der Trend nach unten zeigt und evtl. bei tax-selling eine Übertreibung nach unten besteht. SGI weiter auf Bodenbildungs-Suche...neue Tiefs können weitere neue Tiefs nach sich ziehen...auch hier könnte noch tax-selling anstehen...wo stehen wir dann? Also auch hier warte ich erst mal weiter ab. Fangen die jetzt schon mit tax selling an...? Habe mich eigentlich mehr auf Anfang Dezember darauf eingerichtet! Wenn bei SGI die 0,85 CAN$ (aktuell Doppeltest aus November 2017) nicht halten, wovon ich jetzt generell ausgehe, weil die Aktie einfach im Moment keine Stärke bei steigenden Goldpreis zeigt, kann man sie sicherlich tiefer in den nächsten Wochen kaufen. Produzent! Bei mir Strong watchlist! Premier is a gold-producer and respected exploration and development company with high-quality precious metal projects in proven, accessible and safe mining jurisdictions in Canada, the United States, and Mexico. Premier's team is focused on creating a low-cost, mid-tier gold-producer from its two producing gold mines and two advanced-stage, multi-million ounce, development projects. Westhaven Ventures Inc. has resumed drilling at its 15,542-hectare Shovelnose gold property, located within the prospective Spences Bridge gold belt (SBGB), which borders the Coquihalla Highway, 30 kilometres south of Merritt, B.C. This fully-financed drill program will consist of approximately 2,500 metres of diamond drilling over a strike length of 400 metres at the recently discovered South Zone. Recent drilling here intersected 17.77 metres of 24.50 g/t Au, including 6.78 metres of 50.76 g/t Au. The focus of the current program is to expand on this recently encountered higher grade gold in the South Zone. Please see the plan map of proposed drilling below. Gareth Thomas, President & CEO of Westhaven stated, "We are keen to get back drilling at the South Zone. Only two holes have been drilled into the newly tested southern block and both holes intersected significant gold-silver mineralization. We will be testing both the vertical extent and the strike length of this mineralization." Peter Fischl, P.Geo., Exploration Manager, adds "This follow-up program will look to extend the strike of the South Zone vein system to the southeast by 200 metres. Planned upper and lower cuts to holes SN18-14 and 15 will test the vein zone over a vertical range of 200 metres as well." Silvercorp Metals Inc. has released its financial and operating results for the second quarter ended Sept. 30, 2018. All amounts are expressed in United States dollars. B2Gold Corp. has released its operational and financial results for the three and nine months ended Sept. 30, 2018. The Company previously released its gold production and gold revenue results for the third quarter and first nine months of 2018 (see news release dated 10/11/2018). All dollar figures are in United States dollars unless otherwise indicated. 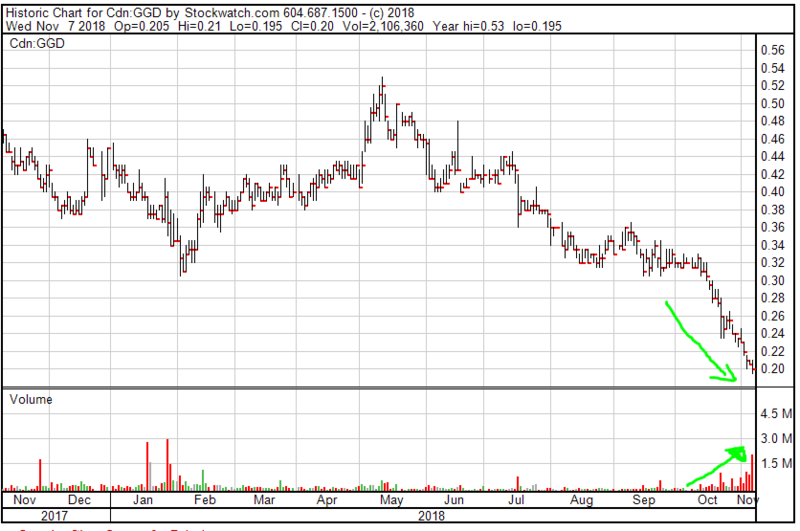 VANCOUVER, British Columbia, Oct. 11, 2018 (GLOBE NEWSWIRE) -- B2Gold Corp. (TSX: BTO, NYSE AMERICAN: BTG, NSX: B2G) (“B2Gold” or the “Company”) is pleased to announce its gold production and gold revenue for the third quarter and first nine months of 2018. All dollar figures are in United States dollars unless otherwise indicated. mal was Long zu 2,08 Euro vorab - liest TOP! Hashchain Technology Inc. has entered into a definitive agreement to amend its previously disclosed asset purchase agreement with Node40. Under the asset purchase agreement for the acquisition of the Node40 business, Hashchain acquired the Node40 business for a purchase price comprising $8-million (U.S.) in cash, payable as to $4-million (U.S.) at closing (subject to a closing adjustment provision), and $2-million (U.S.) on each of 180 days and one year following the closing date, and a total of 3,144,134 common shares in the capital of Hashchain, to be issued in the following amounts and on the following dates: (i) 1.8 million shares on the closing date, (ii) 700,247 shares on the date that is 180 days following the closing date; and (iii) 643,887 shares on the one-year anniversary of the closing date, subject to the vendor of Node 40's option to receive cash in lieu of up to 30 per cent of the shares issuable pursuant to (ii) and (iii) above to a maximum of $600,000 (U.S.) for (ii) and $600,000 (U.S.) for (iii) above. Hashchain assigned to its wholly owned subsidiary Global Crypto Public Accounting Ltd., and Global assumed the cash debt and agreed to discharge such cash debt by paying the vendor $2-million (U.S.) on Feb. 15, 2019. The vendor agreed to cancel 3.6 million shares held by the vendor in exchange for the Masternode rewards and all Dash cryptocurrency paid to Hashchain by customers of the Node40 accounting software. The vendor elected to be paid $1.2-million (U.S.) by Global and receive an aggregate total of 940,894 shares on Feb. 15, 2019, in satisfaction of the second and third share issuances mentioned above from the APA. Immediately prior to the spinoff (as defined below), Hashchain agreed to subscribe for 900 Class A common shares of Global for an aggregate purchase price of $400,000, such funds to be used for working capital expenses, and Global will issue the vendor 110 Class A common shares. Hashchain previously disclosed its intent to separate the company into two independent publicly traded companies: one business focused on cryptocurrency mining (Hashchain) and the other on cryptocurrency accounting and tax compliance software, including other disruptive blockchain technology solutions (Global). HashChain is a blockchain company, and the first publicly traded Canadian cryptocurrency mining company to file a final prospectus supporting highly scalable and flexible mining operations across all major cryptocurrencies. Hashchain taps low-cost North American power, cool climate and high-speed Internet: the trifecta most critical to mining success, to create a competitive position for maximizing the number of mining wins. Hashchain currently operates 100 Dash mining rigs and 8,395 bitcoin rigs with an additional 3,500 rigs to be deployed from its previously announced acquisitions. Once all rigs are operational, Hashchain's mining operations will consist of 11,995 rigs consuming approximately 17.5 megawatts of power. Trevali Mining Corp. has released its financial results for the three and nine months ended Sept. 30, 2018, and intends to launch a normal course issuer bid. Third quarter ("Q3") net loss was $30.8 million ($0.04 per share) and EBITDA1 was a $22.4 million loss on net revenues of $30.5 million. All financial figures are in U.S. dollars. At Perkoa, the mine's 2018 zinc production guidance is raised to 172 to 180 million pounds payable metal, from 164 to 174 million pounds. This news release should be read in conjunction with Trevali's unaudited condensed consolidated financial statements and management's discussion and analysis for the three and nine months ended September 30, 2018, which is available on Trevali's website and on SEDAR at www.sedar.com. Certain financial information is reported herein using non-IFRS measures. Please refer to "Use of Non-IFRS Financial Performance Measures" below. "Clearly Q3 was a challenging quarter from an African logistics and commodity price volatility perspective. Namibian shipments occurred immediately post quarter, we continue to focus on Perkoa concentrate haulage, commodity prices are currently stable and the macro zinc price environment remains constructive" stated Dr. Mark Cruise, Trevali's President and Chief Executive Officer. "Operationally, Caribou's guidance was adjusted downwards to allow the site to focus on increasing development to provide additional mine flexibility going forward. This was largely offset by another stellar production quarter from Perkoa, with the net result that the Company remains on track to achieve annual production guidance." Kam zu 0,05 CAN$ nicht mehr rein. GGD gefällt mir ganz gut. Anaconda Mining Inc. has released its financial and operating results for the three and nine months ended Sept. 30, 2018. The condensed interim consolidated financial statements and management's discussion and analysis can be found on SEDAR and at the company's website. In 2017, the Company changed its fiscal year-end to December 31, from its previous fiscal year end of May 31. For comparative purposes, the results for the three and nine months ended Sept. 30, 2018 , have been compared to the three and nine months ended Aug. 31, 2017. Hut 8 Mining Corp. has released its financial results for the third quarter ended Sept. 30, 2018. Record revenue of $17.7 million for Q3 and $36.4 million for the nine months ended September 30, 2018. Adjusted EBITDA of $7.1 million for Q3 and $18.7 million for the nine months ended September 30, 2018. Completion of installation and operation of 56 BlockBoxes in the City of Medicine Hat facility ("CMH"), representing an increase of 67.2 MW of operating capacity. Closing of US$16 million loan facility with Galaxy Digital. 1,978 bitcoin mined in Q3. Q3 2018 was the first quarter for Hut 8 that included the impact of mining operations at our CMH facility, which includes 40 BlockBoxes beginning in July 2018, together with an additional 16 BlockBoxes in September 2018, for an aggregate of 56 BlockBoxes at that site. As a result of this increased capacity, Hut 8 produced $17.7 million of revenue for the quarter, its largest ever for a single quarter and a 126% increase from the prior quarter revenue of $7.8 million. The Company also recorded $7.2 million in Adjusted EBITDA, an 86% increase from the prior quarter of $3.9 million, largely as a result of increased revenue from the new facility at CMH. Efficiency of the ASIC chips used to mine bitcoin is expected to increase during the colder months in Alberta, leading to improved performance in Q4 when compared to Q3. Hut 8's cost for mining a bitcoin in Q3 2018 was US$3,394, which is below the current market bitcoin price of approximately US$6,500, making Hut 8 amongst the lowest-cost miners of bitcoin in the world. This is reflected in the Company's quarterly results, as its mining profit for the quarter was $8.8 million with a mining profit margin of 51%. Hut 8's mining profit margin and adjusted EBITDA margins were lower during Q3 for two reasons: (i) the price of bitcoin appreciated through the quarter, combined with increased competition from other bitcoin miners (expressed through increased network hash rate); and (ii) to a lesser extent, record setting summer temperatures in Alberta that caused increases in the price of electricity at its Drumheller facility, which facility procures electricity from the Alberta grid. The impact of a hot summer was far less at Hut 8's larger facility in CMH, which purchases the majority of its electricity under contract with fixed prices. "Our Drumheller facility represents approximately 20% of our operations," said Andrew Kiguel, Chief Executive Officer of Hut 8. "This summer, a record-setting heat wave in the province resulted in increased electricity costs during certain periods. The result was increased electricity costs at the Drumheller site by approximately $0.01 per Kilowatt hour on average. We are actively managing our exposure to market prices through a number of different means. Despite this, Hut 8 achieved record revenue for Q3 and strong overall margins." A conference call has been scheduled to discuss the Company's third quarter financial results, hosted by CEO Andrew Kiguel and CFO Jimmy Vaiopoulos, starting at 10:00 a.m. ET today. Hut 8 currently operates a total of 73 BlockBox Data Centers, including 56 BlockBoxes at its facility in CMH, Alberta, each BlockBox with 1.2 MW of capacity, representing an aggregate of 67.2 MW of maximum operating power capacity. Hut 8 is currently operating: (a) approximately 63.2 MW in CMH with a target to reach full capacity of 67.2 MW in Q1 2019; and (b) 17 BlockBoxes at its facility in Drumheller, Alberta, representing an aggregate of 18.7 MW of maximum operating power capacity. Hut 8 has a total maximum operating power capacity of 85.9 MW and an average actual operating hash rate of over 640 Petahashes per second. This earnings release should be read in conjunction with the Company's Management Discussion & Analysis, Financial Statements and Notes to Financial Statements for Q3 2018, which has been posted under the Company's profile on SEDAR at www.sedar.com and are also available on the Company's website at www.hut8mining.com. Since beginning its mining operations in December 2017, Hut 8 has mined more than 4,200 bitcoin. As of September 30, 2018, Hut 8 had 85,228,858 shares outstanding, 965,000 options and 2,882,222 warrants. Hut 8 Mining Corp., headquartered in Toronto, Canada is a cryptocurrency mining company established through an exclusive arrangement with the Bitfury Group, the world's leading full-service blockchain technology company. Through the Bitfury Group, Hut 8 has access to a world-leading proprietary mix of hardware, software and operational expertise to construct, optimize and manage data centres in low-cost and attractive jurisdictions. Hut 8 provides investors with direct exposure to bitcoin, without the technical complexity or constraints of purchasing the underlying cryptocurrency. Investors avoid the need to create online wallets, wire money offshore and safely store their bitcoin. Hut 8 provides a secure and simple way to invest. In Oktober 2018, First Cobalt Corp released the results of its first NI 43-101 Mineral Resource Estimate for the 100 percent-owned Iron Creek Cobalt Project in Idaho. The company announced Inferred Mineral Resources of 29.6 million tons (26.9 million tonnes) grading 0.11 percent cobalt equivalent, under a base case scenario, and an alternative underground-only scenario indicating 4.9 million tons (4.4 million tonnes) grading 0.30 percent cobalt equivalent (http://nnw.fm/Af2zz). Lucara Diamond Corp. has released its results for the quarter ended Sept. 30, 2018. -- Quarterly sales revenue of $45.7 million (Q3 2017: $77.9 million) or $450 per carat (Q3 2017: $1,161 per carat) recognized during the quarter. This revenue includes proceeds of $3.9 million received in July 2018 related to the Company's June tender. Third quarter sales from 2017 included the sale of the Lesedi La Rona ("LLR") for $53 million ($47,777 per carat), adjusting for the sale of the LLR, the Q3 2017 average sales price was $389 per carat. -- The operating cash cost for the nine months ended September 30, 2018 was $41.20 per tonne processed (2017: $32.40 per tonne processed) compared to the full year forecast cash cost of $38-$42 per tonne processed. Year to date operating cash cost per tonne processed was impacted by higher than expected tonnes mined and processed, and an increase in the cost per tonne mined due to the mining contractor transition which commenced mid-year. Forecast costs for the 2018 fiscal year are still expected to be within guidance. -- Q3 2018 EBITDA of $18.2 million (Q3 2017: $49.8 million) reflects lower revenues attributable to a smaller volume and lower average price of exceptional stones sold, as compared to Q3 2017 which included the sale of the 1,109 carat LLR. -- Net income for the three months ended September 30, 2018 was $5.1 million ($0.01 per share) as compared to net income of $32.9 million ($0.09 per share) in the comparative quarter of 2017. -- As at September 30, 2018, the Company had cash and cash equivalents of $31.1 million. The $50 million credit facility remains undrawn on September 30, 2018. -- 2018 guidance has been increased for tonnes of ore mined and carats recovered; the remainder of the Company's guidance remains unchanged for 2018. Zuviele Stücke wurden gestern und auch heute selbst zu 1c geschmissen, Hauptsache weg. Westhaven Ventures Inc. has commenced an airborne geophysical survey across its 2,784-hectare Skoonka and 6,167-hectare Skoonka North gold properties, located within the prospective Spences Bridge gold belt (SBGB). noch kein delisting, aber wohl kurz davor, schaut nicht gut aus! Aktie weiterhin ausgesetzt!